We all love space! And we all know that you can’t have it without keeping your home organized! So you might be wondering, do I really need a nail polish rack? Wall-mounted or just a countertop organizer? 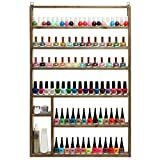 Well, if you wanna keep your “nail styling arsenal” where you can easily have access to, thus saving a little bit of time and adding a little bit of comfort to your life, I would recommend you the first option, a wall-mounted nail polish rack. Also, one of the benefits of a wall mounted rack is that it allows you to line up your nail polishes how you want and still adds a bit of decor to your room. 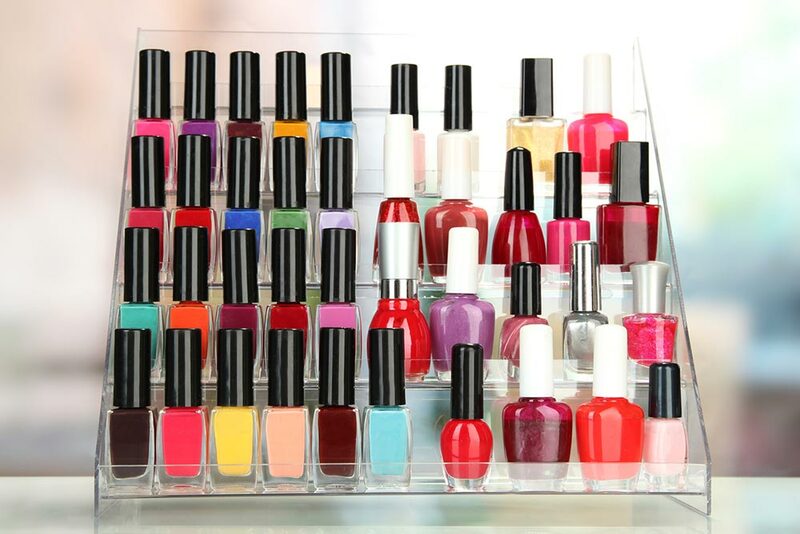 Plus, I’m sure you’ll enjoy the extra space in your cabinet when your polishes will no longer be there. How about not having to buy duplicates anymore since your polishes are literally in front of you? That’s also a nice aspect of having things organized. A nice wall rack can also help you create the mood and atmosphere of a salon or spa, adding up a little bit of a motivation boost when you’re feeling lazy to work on your beauty routine. Whatever your reason, let me help you with more information on the types and the best wall mounted nail polish racks currently on the market. 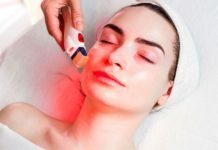 Nowadays, there are a lot of racks on the market, either online or at your favorite brick-and-mortar beauty shop, with various differences in price, size, material, color, durability and sometimes, placement. When it comes to types, the most popular ones are the countertop, table display, and wall hanging racks. The two major materials in use are metal and acrylic but you will find some made out of wood too. 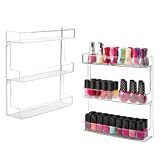 Acrylic racks are usually more versatile than the metal ones, having a more professional look and can come transparent, better highlighting the colored variety of your nail polishes. They are also easier to hang because they are lighter. However, metal racks are more attractive, durable and sturdy when compared to acrylic ones. Let’s cut to the chase! I’ll be taking them one by one and try to summarize as best as I can the features, pros, and cons and why you would want to get one. 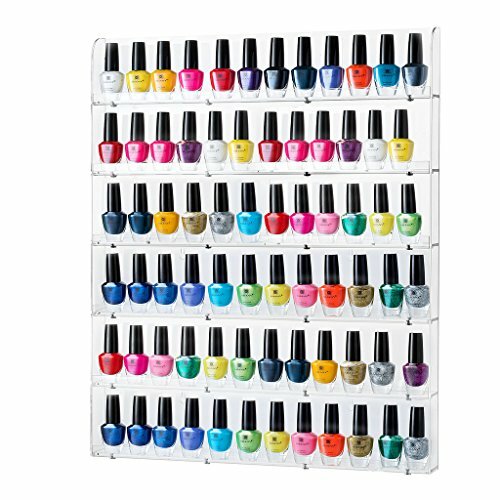 This is a high-quality acrylic nail rack wall display manufactured by Fuji used to hold and display nail polish bottles for easy selection. There is a signboard that comes with it. You can choose to keep it or throw it away. 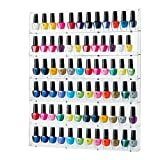 It is a cheap rack that can hold up to 96 bottles or more given that it has six rows and each row can store about 15 nail polish bottles. Each row also has a plastic bar which can help in preventing the bottles from falling out. It has a dimension of 20.5” W x 2” D and sign dimension of 20.5” x 4. All in all, a good rack which looks professional and which can be easily hanged on the wall. Are you up for a challenge? Here’s one for you: How to Cure Gel Nails Without UV Light . Give it a try and let us know how it went! It has a thick crystal clear acrylic and a dimension of 10” L x 1.75” W x 17” H. With a net weight of just 2 pounds, this product is surely poised to transform your home with its elegant look. 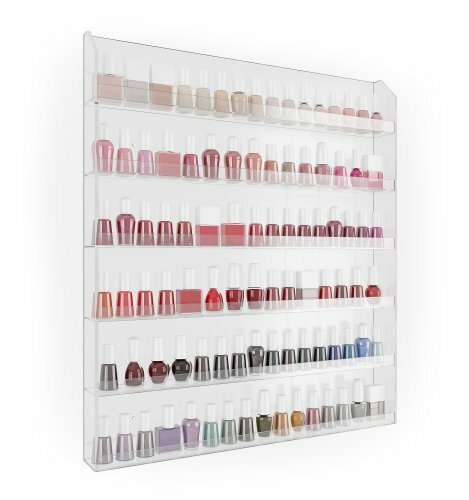 Organize your nail polishes the right way with this gorgeous D’Eco Acrylic wall-mounted rack. You’re a beauty queen! But do you know what’s the difference between gel, dip, and acrylic nails? Here’s more on the subject! 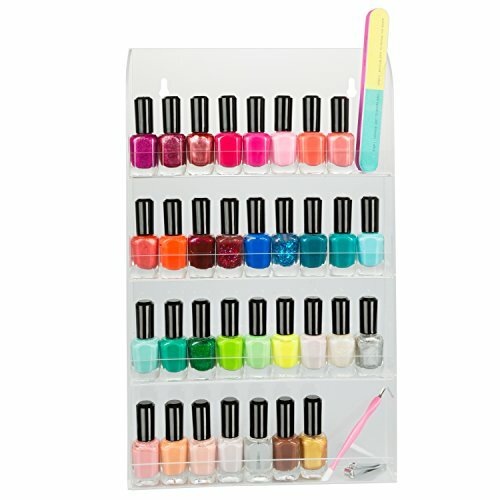 If you want to both organize and get the most out of your polishes and makeups, then this elegantly designed rack might be the best choice. Manufactured by Best Choice Products, it tends to catch everyone’s attention through a nature-inspired design represented by birds and tree silhouettes. It comes with 5 shelves and can store up to 70 nail polishes. With a weight capacity of 4.4lbs and overall dimension of 23.5” (L) x 2.75” (W) x 23.75” (H), this product is surely one of the best racks you can stumble upon. Are you scared of using UV light on curing your nails but still want to enjoy a long lasting polish? There’s an alternative. 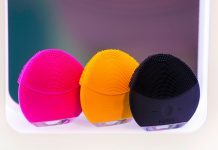 Meet the UV/LED nail dryers – safe and easy to use. Wanna know the difference between UV and LED nail lamps? 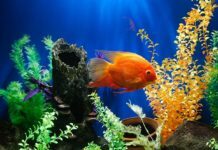 Here’s an article which might help you out! This wooden shelf rack is made of sleek lines and comes with a classic finish which fits in beautifully with any home decor. 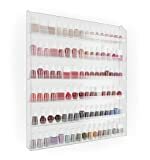 The 8 shelf compartments in various shapes and sizes provide you plenty of space to store and arrange your nail polishes, facial cleansing brushes, nail cutters, essential oils, cosmetics, nail fillers, or any other beauty product you might be working with. Built for being hanged on a wall, this rack can easily be placed on a countertop with a mounting kit. One thing’s for sure: the contrast between the wood and your nail polishes are a perfect match. This product comes with 8 shelves in various shapes and sizes for displaying your collectibles in a creative way and a spacious rack which let you store a lot of bottles. What really makes this product stand out is that it can complement any design style and can be used without any problems as a space-saving decoration for homes, offices or professional salons. Will surely accommodate many other things you might need to store or showcase. How long do acrylic nails last? Honestly, it depends and it can go from a few days up to 3 weeks. 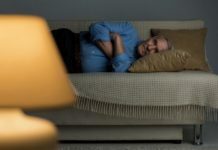 Here‘s how you can make them last longer. 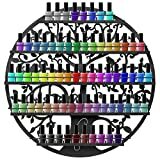 Looking for a solid nail polish rack? Then MAKARTT is definitely for you. This stylish rack is a wall-mountable 3 tier acrylic rack which can fit into both your bedroom or a professional beauty salon. 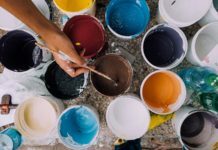 It can hold 33-45 standard nail polish bottles and you might find space for some craft supplies and seed beads as well, which makes it a versatile product which can be used either in your bedroom or kitchen. This product can easily be brought as a gift for your dear ones due to its portability, sturdiness and pleasant aesthetics. With a dimension of 15in x 1.7in x 2in and a separate 3-shelf holder, it is easy to install and can be mounted by a single person without any effort. Plus, you won’t have to worry about cleaning it because it doesn’t have many parts to assemble and thanks to the extra thick acrylic, it’s going to be quite easy to clean. This one’s a sturdy rack with a versatile design which makes it a great fit into any room. 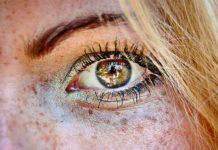 Thanks to the innovative storage technology, finding the color you want is a breeze and might bring in quite a bit of fun. 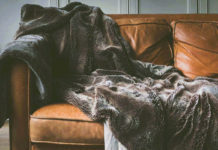 Plus, you could just set it in the kitchen to organize spices, flavoring oils, baking supplies or in the bathroom for medicine bottles, vitamins, and essential oils. What I love about this rack is that it has three generously sized shelves and thanks to the front masks, you can bet that nothing will fall off the rack. I previously mentioned the versatility of this product. This rack is specially made in such a way that it can be mounted on walls in bedrooms, bathrooms, and closets for adding a bit of smart storage to any house. The framework is made of durable BPA and Chlorine-free shatter-resistance plastic so it can be cleaned with just water and mild soap. With a dimension of 15in x 11.2in x 3.2in and weighing just 1.5 pounds, this rack should be for sure, on your wishlist. Made up of sturdy black painted metal, a nice option for storing all kind of bottles you possess including your perfumes and other cosmetics. It is suitable for home storage or professional use and can hold up to 90 to 120 bottles. Every row comes with a plastic bar for preventing the bottles from falling out. It has a chic retro flower unique design and can easily be door or wall mounted. On the other side, this rack can’t be used as a stand so it needs to be wall hanged. 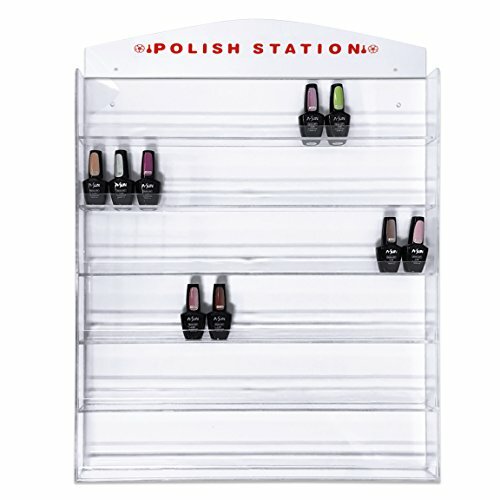 This product is without a doubt one of the most elegant and professional-looking nail polish storage options on the market. For sure, this one’s going to effectively and elegantly serve your needs. 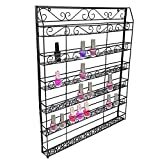 This product is a sturdy acrylic polish rack that keeps your bottles safe, organized and ready for use. The transparent glass-like acrylic will emphasize and enhance the color diversity of your nail polish collection. It has two holes on top for easy wall mounting which make it great even for mobile grooming vans. It is welded creatively with eye-catching decorations and a glossy finish which tend to make it look elegant in any household. With a large space of 6 rows which can contain up to 17 bottles each and a beautiful design and sturdy structure, this rack is meant to last. I’m absolutely sure you’ve seen one of these before, either in your local beauty store or nail salon. The minimalist design of this product is definitely a key factor. It’s meant to be hanged on the wall, the mounting system being included in the pack. Sturdy enough to support the weight of your nail polish collection, it has the room to hold up to 102 bottles, thanks to the 6 rows which can accommodate up to 17 bottles of various sizes and shapes. 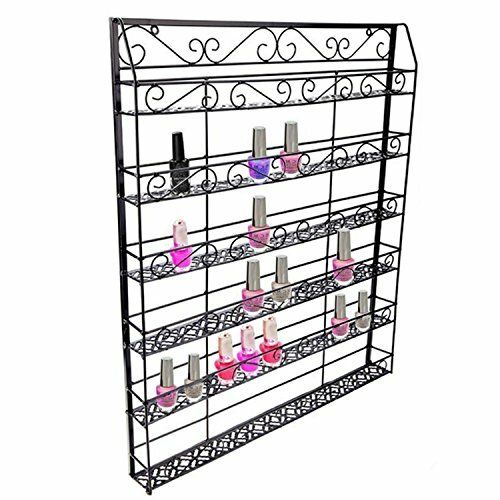 Above are 9 of the best wall-mounted nail polish racks you could find on the market. My advice for you? It’s time to clean up your desk and organize your beauty bottles the right way. Get yourself a rack and you can bet you won’t buy nail polish duplicates anymore.